In 1998 multi-instrumentalist Marek Styczynski and singer Anna Nacher started a new project, named Projekt Karpaty Magiczne. The group released the debut album Ethnocore (Fly Music, 1999), the soundtrack to a play, Ksiega Utopii/ The Book Of Utopia (Obuh, 1999) and Denega (Obuh, 2000), a recording based on samples of Baltic seals and other marine sounds. The Magic Carpathians Project, as it was renamed for western audiences, plays an ambient, cosmic, jazz version of Atman's pan-ethnic music. While maintaining the same ambient/orchestral approach towards ethnic sources, Ethnocore II: Nytu (Drunken Fish, 2001) leans towards the Indian raga (India Mal, India Mata) and Buddhist chanting (Nytu, Denega). The album is dedicated to "nytu", an ancient vocal technique of the Carpathians which is Nacher's main tool. But Tibetan and Indian harmonies permeate the entire work and in the end the album sounds much more Asiatic than European. Compositions are often immersed in a forest of woodwinds, while samples of Tibetan voices augment the eerie atmosphere. An arsenal of didjeridu, dulcimer, synthesizer, violin, clarinet, sitar and percussions attacks the woodwinds and the voices from all directions and turns each track into the musical equivalent of boiling magma. Compared with Atman, the new project is more "artificial", ponderous, brainy. Where Atman was a spontaneous joy of world sounds, PKM is an intellectual's view of popular music, a scientist's vivisection of alien organisms. Something is lost in the process, just like so much of modern ethnic/ambient/dance music loses not only the spirit but also the artistic value of the originals. The duo triumphs when the sheer number of sonic events overwhelms the listener, as in Lluru, or when the improvisation and the concept border on free-jazz, as in Transcarpathians. Western music has trodden down this path before, when German musicians like Stephen Micus and Georg Deuter explored and assimilated Indian culture. It is not a coincidence that the experimental mini-sonatas Radical Acoustic and Atropa Belladonna Cries recall Micus and Deuter's experiments of the 1970's and 1980's. San Diego, California�as far as you can get from Ellis Island without leaving the 48 contiguous states. How many gigs can a band that plays polkas and freylakhs hope to get? The institutions of San Deigo�s older Eastern European communities � Jewish, Armenian, Hungarian, Polish � have less in connection with the Old Country than their counterparts east of the Mississippi. The industrial boom that began with the Second World War brought Slovaks, Ukrainians, and Serbians who became quickly assimilated. The new immigrants, children of the Communist regimes, are even less preservationist. But the Electrocarpathians, founded in 1988, have not concerned themselves with preserving the music of the Old Country. Their first gigs were Jewish weddings (San Diego�s large Jewish community has roots in the Wild West era), at which they incorporated the Greco-Turkish (belly dancing) elements of California�s native Surf Rock. In 1991, lured to the Midwest by two weeks of work in Chicago, they collected music in the Czech farm towns of eastern Iowa, Nebraska and Kansas, and Transylvanian Saxon material and Hungarian inspiration from Ohio. The mission of the band became understanding what has happened to East European music since it arrived in North America, and making it rock, because the aim of the Electrocarpathians is to make you want to dance. Elvira's dreams of performing in the Parisian Revue, "Yes I Can-Can" are put on hold when she accidently winds up in a mysterious, medievel castle inhabited by the bizarre and sinister Lord Hellsubus. Homepage includes photos, script excerpts and the movie trailer. �May I therefore share a few thoughts about what I believe should be the task of the World Congress during its next ten-year cycle. These tasks can be grouped into three categories: (1) administrative matters; (2) youth; and (3) civic activity. �With regard to the second task, youth, I would propose that the World Congress take the initiative in organizing a World Rusyn Youth Forum to take place in the context of the next congress two years from now. The precise configuration at the proposed Youth Forum should be decided by the young people themselves (by the way, �young� should mean no older than 30). The World Council should convene an initial coordinating committee of young people from all or most countries where Rusyns live and during the next two years find some funds to pay for the transportation and lodging of the participants at what would become the First World Rusyn Youth Forum to be held in conjunction with the VII World Congress of Rusyns. 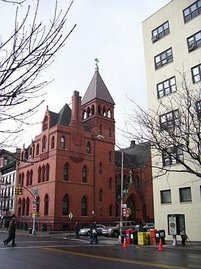 Deals with the history of the Ukrainian community of New York�s East Village, which included and still includes many Lemkos and other Rusyns. As a travelling Andy Warhol exhibition hits Bratislava this month, a museum devoted to the pop artist in the opposite corner of Slovakia struggles towards its 10th anniversary. Located in a crumbling city of 7,000 in north-east Slovakia, the Warhol Family Museum of Modern Art in Medzilaborce was a dream come true for local art enthusiasts and Rusyn patriots alike when it opened in 1991. Warhol's parents were Rusyn - an ethnic minority in Slovakia numbering between 60,000 and 100,000 - from the small village of Mikov� outside Medzilaborce. The museum was to be a source of pride for the town and a valuable tourist attraction. But operating for nearly a decade on a shoestring budget, the Warhol Museum has never found solid ground: financing has been scant, and its home remains the town's former culture centre, a communist monolith that was intended to be a temporary solution in 1991. 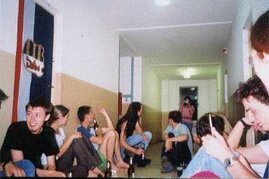 A new Slovak-language website dedicated to "imaginary Svidnik underground culture" hit the internet recently. The site is called Zvolo�, which in the local Slovak dialect means "rabble." Svidnik, in northeastern Slovakia, is home to a sizable Rusyn minority, and the site clearly reflects this. One of the site's pages is dedicated to the Rusyns, "or Rusnaks, as the common locals of Svidnik are called." Aside from a brief history of the Rusyns, the local Skazen (open-air museum) of Rusyn folk architecture is also featured prominently. According to the site's author, "the imaginary Svidnik underground draws its strength from the influence of the unrepeatable word plays of that uncodified [Rusyn] language. One of them is also the name of the entire project." Though it is part of the local Svidnik dialect, the origin of the term Zvolo� is in fact Rusyn. The local Andy Warhol Pop Art Club, run by Joe Keselica, also has a page on the site. 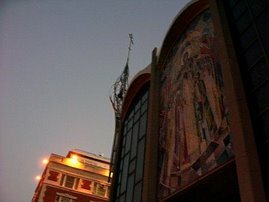 The club organizes exhibits, concerts and other cultural activities. Keselica's film 15 Minutes of Fame, a documentary about Warhol's Rusyn roots, won a UNESCO award in 1993. Also on the site are descriptions of the local bar scene, local bands, art and a performance space called Cafe Holi�stvo. Zvolo� also features a travelogue of Transylvania. "Zvolo�: Svidnik Underground Home" can be found here. YUGOSLAVIA, 3 June 2002. Ruski Kerestur's Rusyn and Ukrainian groups joined forces on 10 May to host the United Party, an invitation-only cocktail party designed to show that the two groups can rise above their differences and cooperate towards common goals. More than 50 people attended the party, which lasted until 4 a.m.
Five groups joined in: Ruska Matka's Youth Forum, the youth group of the Union of Rusyns and Ukrainians (Sojuz), the magazines MAK and Time Out and a brand new organization called Teledom Ruthen. Despite its name, Teledom Ruthen has nothing to do with television. It is a small network of cultural centers in villages and smaller towns. The centers offer such services as internet access, foreign language classes and theatre workshops. 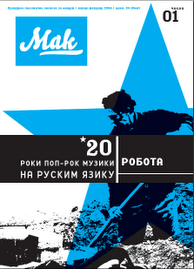 The party also honored MAK, which began publication last September. Ruski Kerestur's Rusyns and Ukrainians hope to build on the success of the United Party with further joint actions. In his letter from the editor, Ljubomir Rama� takes up two issues chairman of the Commission for Information of the Skup�tina (Assembly) of the AP Vojvodina �or�e Suboti� recently pointed out concerning the media: the need to involve more young people in the media, and self-censorship among journalists. On the surface, the first problem is not so urgent in the Rusyn-language media. Young Rusyns are clearly interested in journalism, as evidenced by the enormous response to the recently-founded Novi MAK. However, Ruske Slovo (and other media outlets throughout the province) are finding it impossible to hire "young blood" due to a lack of funding. The majority of Vojvodinian minority media is funded by the provincial Skup�tina. Turning his attention to self-censorship, Rama� writes that this is a "remnant of recent times" which is "difficult to correct" in journalists who have been working in the field for decades. It is worthwhile to point out self-censorship among journalists is a problem common to virtually all Central and Eastern European societies in transition. However, Ramač sees the two issues as being intertwined. Training young people in the ways of "real" journalism will not only get them more involved in the media, but will also offer a major opportunity to combat self-censorship, since training new journalists is easier than trying to break the bad habits of older ones. However, none of this is possible without additional funding. This year's Med�ilabirce 40th Festival of Culture and Sport will feature the first major event organized by the Rusyn Youth Movement of Slovakia, a concert entitled "Rusyn National Song in the Lives of Young People." The concert will be held on 30 June 2002 as the final event of the festival. Prague's IGNIS will perform, along with the Med�ilabirce folklore group Kamjana. The event will also feature a short program prepared by local students, and will be followed by a "national party" with Rusyn songs preformed in modern styles by Roland from the town of �ir�o. After Andy Warhol, the best-known gay Rusyn is quite possibly Atila Kova�, who made news in Yugoslavia and throughout Eastern and Central Europe in the fall of 2001 when he launched De�ko, Serbia�s first monthly mainstream gay magazine. Kova�, who is of Rusyn and Hungarian ethnicity, has become better known to Serbia's Rusyn community primarily through the magazine Novi MAK, which ran an interview with him in its second issue. He holds a degree in theatre, film, radio and television directing from the University of Novi Sad. Among his professional experience is work with operas and theatres in Novi Sad, and five years spent with TV Novi Sad. 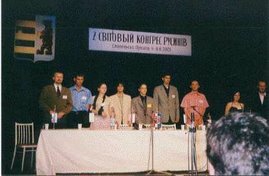 In January 2000, he was among the organizers of the first conference on sexual minorities in Yugoslavia. and an article about De�ko from Transitions On Line. 1. The event will be held Sunday, June 8 and conclude with a celebration of Rusyn culture that evening. Attendees to the Forum will meet at that event with the adults who are there attending the Rusyn World Congress, the meeting of Rusyn leaders from throughout the world. 2. C-RS would like to help send you there. How can you tell us you�re interested ingoing? A. if you are between the ages of 15-17, write no more than two pages on why you should be selected to attend this event. B. If you are between the ages of 18-30, simply tell us in about 1 page why you are interested in Rusyn culture and why you think it would benefit you and the American Rusyn community for you to attend. CRS will have scholarships available for those who are selected to attend to help defray the cost..
Attendees 15-17 MUST BE ACCOMPANIED BY AN ADULT. The often-repeated serial images of famous faces or commercial products in Andy Warhol's art mirrored a culture of mass production. Imagine what a kick he would have had out of seeing one of his paintings reproduced millions of times -- 61 million to be exact. ..."Is there a difference between the imagination of the diasporic community as represented by printed media, and that of the �virtual community� of the web? I would say that the answer is both yes and no. Before the second world war, Walter Benjamin was already saying that mass media could be an alternative to face to face interaction for creating community. Once access to public media became available to all, the gap between author and public would become blurred: "At any moment the reader is ready to turn into a writer" (Benjamin 1979:398)..."
Fedor Vico was born on November 9, 1944 in Eastern Slovakia. Graduate of the Vocational School of Bratislava (1962), where he majored in wood carving. His cartoons began to be published since he bacame 15, at first in a satirical magazine "Rohach", but gradually began to appear in various other domestic and foreign publications. Fedor Vico has participated in many exhibits and competitions, where he has received many awards. Here we can see some of his cartoons in the "Il'ko Sova from Bayusova" series. He was one of the founders, and after several attempts, has since 1994 become the editor of a satirical-humorous bi-weekly "Bumerant". He considers himself to be an ethnic Ruthenian (Rusyn), resides in Prashev in the Slovak Republic, at 2 Yarosha Street, tel. 091/731-474. This is Cyber Ruthenia. Home of Cyber Ruthenians. We lost our country and became citizens of Atlantis. We don't have a physical land, but we do have nationality, and we are giving CR citizenships and CR passports. Because this is Atlantis, we are allowing double and triple citizenships. 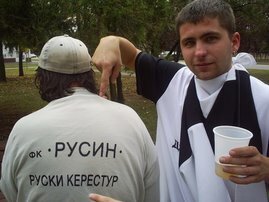 If you feel Ruthenian, you are welcome to apply for CR citizenship, regardless of your current nationality and citizenship, and you will be accepted. This land will grow as our citizens wish. Neither faster, nor slower. Neither more, nor less. So, this site will always be under construction. For a solid country to grow, even a virtual one, it takes some time. Become a citizen of Cyberruthenia! 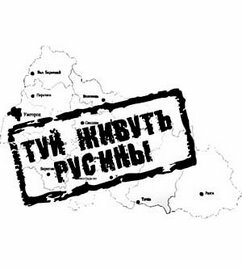 Transcarpathian Rusyn writer Ivan Petrovcij has a new(ish) website. Contains excerpts from his book, Na�i Spivanky, as well as an open letter to Paul Robert Magosci and other resources. Lemko folk songs - sung to modern beat. Young Rusyns in the Vojvodina run this magazine, which frequently covers pop culture topics.